The Husted line is on my father’s side of the tree – and the last Husted in the line was Harriet (1842-1909), Mrs. Rev. Elisha Watson. There is no lack of great Husted stories. And so many versions of each! I’ll keep it simple. My 10th great-grandfather Robert Husted arrived in Massachusetts in May of 1635 from Weymouth, England. 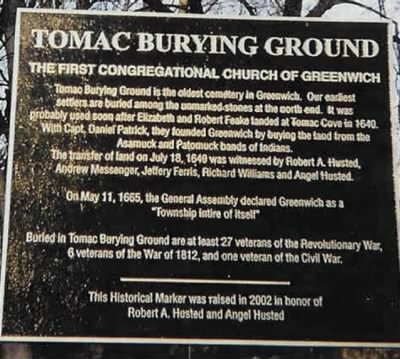 He and the other 100+ passengers, as a group, were granted leave by the General Court of the Massachusetts Bay Colony to settle near an old trading post called Wessagusset. By September, Wessagusset was incorporated under the name Weymouth, of all things. At some point, Robert’s wife Elizabeth, daughter Ann, and sons Angell (my 8th great-grandfather) and Robert made the crossing as well. It seems likely they were with Robert on his voyage, but there are no references to them until January 1640. 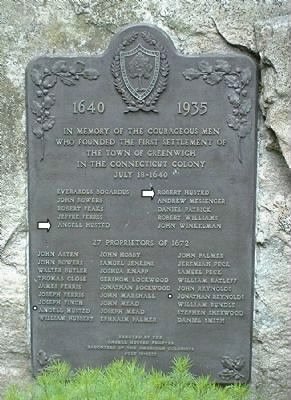 July 1640, Robert Husted and Andrew Messenger witness the main land deed purchase of Greenwich by Daniel Patrick and Robert Feake. Jeffery Ferris and Elizabeth Feake also received land on this document, with Angell Husted and Richard Williams as witnesses. In July, 1642, Angell tells Robert Feake he wants to leave Stamford and come to Greenwich. Feake sells Angell some land. 1646 – Angell Husted, his wife Rebecca, and pretty much everyone in earshot, help with the birth of Elizabeth Feake’s baby. By late 1647, Robert Feake had some kind of mental collapse and returned to England, abandoning Elizabeth and their family. Soon Elizabeth was with a new husband – Mr. Hallett. OK – time to fess up. Yes, the Husteds were key players in the purchase and settlement of coastal Connecticut. And Connecticut is up to its collective earlobes in plaques bearing the Husted name. In all its iterations. But this was all a ruse, a roundabout way of showing what a sucker I am for the Elizabeth Fones Winthrop Feake Hallett story. 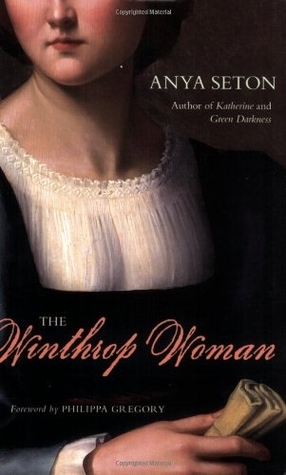 Published in 1958, Anya Seton (a/k/a Anne Seton Chase; Dragonwyck, My Theodosia) wrote a biographical novel called “The Winthrop Woman” all about Elizabeth. It’s the latest in my series of crackin’ good reads – wonderfully researched and written – and my ancestors are IN it! By name!